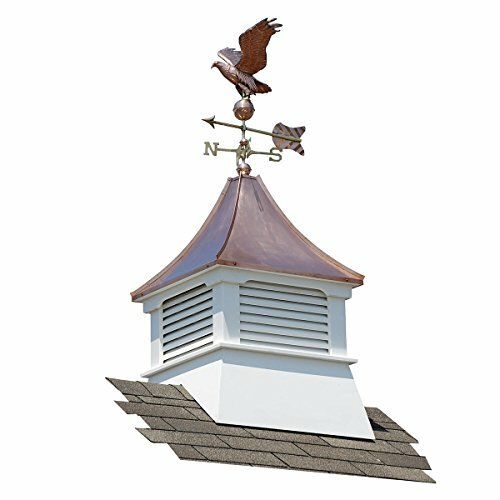 There's something so classic about the Accentua Olympia Cupola with Eagle Weathervane that we feel like it's only right that we put on a powdered wig and help you cut down a cherry tree to celebrate. This timeless architectural accessory is hand-crafted by Amish artisans using weather-resistant vinyl to create the body. The four-sided design features louvering on each face and a curved top covered in real sheets of thick copper. On the very top you get a weather vane sporting a flying eagle. The assembly is easy and you can also install this cupola yourself onto almost any standard roof with a pitch up to 10/12. Dimensions: 24W x 24D x 62H in.. Crafted from maintenance free vinyl with a copper roof. White base and a copper finished roof. Can be used for any roof pitch up to 10/12. Made in the USA by Amish craftsmen. If you have any questions about this product by Accentua, contact us by completing and submitting the form below. If you are looking for a specif part number, please include it with your message.